Kenn Jones started his career as a licensed architect working in New Jersey and New York City. His career as an educator paralleled his career in architecture where he taught undergraduate courses in studio art, design, and the history of art and design as well as graduate courses in non-profit management. Kenn has substantial experience with developing project-based curricula, interdisciplinary programs, and adult education/professional development. He has served as a U.S. 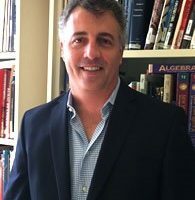 Diplomat in the Middle East and as the Executive Director of Peters Valley Craft Education Center and the New York Foundation for Architecture; most recently he was the Curator of Education for the New Jersey State Museum. Kenn holds a M.Arch. degree from the University of Maryland and post-graduate studies in historic preservation and design as a Rotary Foundation Fellow at the University of Edinburgh in Scotland. Using strategic planning and creative problem solving to achieve organizational goals and objectives, Kenn ties together his experiences in education, executive management, and philanthropy ~ an approach he brings to the Salvadori Center.